The name of this ancient noble family morphed many times during the centuries. The family was known as Karaczun, Karaczon, Karachon, Karachun, Karacsony, Karatsony, Karatsonyi, or Karacsonyi. The word Karacsony means "Christmas" in Hungarian, and so is a relatively common name. However, the Karacsony family of Hodos was one of the oldest in Bratislava County. Hodos, now Vydrany, is a village in the Csallokoz in Bratislava County, and falls within the district of Dunajska Streda (Dunaszerdahely). It appears that in the earliest times it was property of the Castle of Bratislava - but as so often happened with these villages, the warriors who settled there changed into the hereditary landowing nobility. The Vermes and the Hodossy families are thought of as having descended from these original landowners, and so is the Karacsony family. The Karacsony of Hodos had a fruitful history in the middle ages, as Ivan Nagy's Magyarorszag Csaladai testifies; plenty of names have been recorded in legal land disputes based around Hodos. Nagy Ivan records the archival mentions in 1295 of Nicolaus and Karachon, the sons of Bulchu. From then on, legal disputes around land ownership abound, involving such interesting and important characters as Nicholaus Esterhazy or the 15th century Hungarian Palatine Michael Orszagh of Guth. The progression of this family from relative wealth and power to decline and loss of land ownership is a typical story of the ancient middle nobility of Hungary, which attempted to navigate the double dangers of inadequate inheritance laws and the expansive tendencies of the great magnates hungry for land. The Karacsony family moved to Rethe (now Reca), a village near Szencz (now Senec) in Pozsony County, in the 17th century. However the family never forgot its place of origin and has kept 'de Hodos', 'von Hodos', but most frequently 'hodosi' as a predicate well into the 20th century. Of more recent members of the family, Karoly Karatsonyi de Hodos was an infantry officer, who in 1859 received from Emperor Franz Josef a letter confirming his pensioned status, ending his career as Major in the 34th Austro-Hungarian infantry regiment the "Prince Regent of Prussia". In the 1920s and 1930s, hodosi Karacsony Sandor was Royal Chief Forestry Advisor of Hungary. A certain element of celebrity has recently touched the family name, after Lena Meyer-Landruth won the Eurovision song contest for Germany in 2010. Her grandmother was Hanna Karatsony von Hodos, whose husband Andreas Meyer-Landruth was a distinguished Cold War diplomat. Though the gossip columns abound with mentiones of Lena Meyer-Landruth's Hungarian heritage, it may come as a surprise to some that this family is from a village in Slovakia. 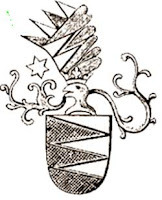 As with many ancient Hungarian families, the Karacsony of Hodos never seemed to have received a patent of arms, and therefore they do not have an 'official' coat of arms. However, as all nobles, they used seals engraved with a coat of arms, almost certainly self-designed. The Karacsony seals contain typical noble attributes, such as arms holding swords, celestical bodies, or hussars.